Pitt will begin the 2015 season with its fifth head coach in seven years, so it’s safe to say that this program has seen plenty of ch-ch-changes over the past few years. Amazingly, Pitt has gone to a bowl game every single year in that stretch. I had a high school coach who use to emphasize “responding to sudden change”. Over the past few seasons, the Panthers have not only done that, they’ve been successful doing it. Pittsburgh’s offensive philosophy is molded after teams like Wisconsin and Arkansas: punishing running game behind a behemoth offensive line. That makes plenty of sense when considering that their last head coach, Paul Chryst, was the offensive coordinator for current Arkansas head coach Bret Bielema when he was at Wisconsin. Consequently, Chryst left Pitt to take the head coaching job at Wisconsin. James Conner is the perfect running back for this system too. He is a true bruiser, so much so that coaches considered playing him at defensive end last season. Conner rushed for 1,765 yards last year on nearly six yards per carry, and he rushed for 26 touchdowns. In hindsight, it’s probably a good idea that the coaching staff didn’t burn the guy out trying to play him both ways. Conner also gets the entire right side of his starting line from last season back including two centers with ten or more games starting experience in Artie Rowell and Alex Officer. Officer is likely to be the guy who gets the nod at center, and Rowell has been mentioned in discussions to fill the vacant left guard spot. Speaking of which, even with three starters back it still hurts that the two guys Pitt is replacing were both all-conference picks on the left side of the line. Matt Rotheram, a three-year starter at guard, was a second team All-ACC pick, while T.J. Clemmings was a first team All-ACC tackle and a fourth round pick by the Minnesota Vikings. Pitt does have one thing that neither Arkansas, nor Wisconsin can boast, which is an elite deep threat in Tyler Boyd. Boyd had over 1,200 receiving yards last season and was dynamic in the kicking game as a return man. He has been so impressive that he was named to Phil Steele’s preseason first team All-America team. Boyd and Conner also make up the only returning receiver/running back duo in the ACC to break 1,000 yards receiving and rushing last season. Now, the problem might be finding someone to take the double teams off of Boyd, because there is no clear second option in this passing game. Tight end J.P. Holtz is the only other returning receiver to get to even 100 yards receiving last year. Holtz caught 21 passes for 199 yards. Oh, and if you thought I wasn’t going to mention the most important position on the field, then you were almost right. I completely forgot to mention Chad Voytik. It’s not that Voytik is bad, as a matter of fact that might be why he flies under the radar so frequently. With Conner and Boyd drawing all of the attention, all Voytik has to do is be decent and protect the football to give his team a chance to win. He did that for the most part last season completing over 60% of his passes and throwing 16 touchdowns to seven interceptions. Pittsburgh is probably going to have to improve a good bit defensively if they want to take a step forward this season. The Panther defense wasn’t bad last season, but for a team that predicates itself on running the ball and playing defense they weren’t quite good enough last season. Also, don’t expect that philosophy to change any with Pat Narduzzi at the helm. Narduzzi had been one of the most coveted defensive coordinator candidates for a head coaching job before taking the Pitt job. Both interior linemen Darryl Render and K.K. Mosley-Smith return in 2015, as does defensive end Shakir Soto. Render is the most productive member of that group with six tackles for loss and two sacks in 2014. The Panthers should also get help from the return of Ejuan Price. He was limited to just six games in 2013 due to injury, and a separate injury cost Price all of 2014. He is back now and healthy and expected to start in a rotation with Soto. Rori Blair may be the best player on the line even if he isn’t a returning starter. Blair led the team in sacks last season as a backup with five. That speaks both to Blair’s ability to get to the quarterback and the rest of the team’s relative lack of ability. 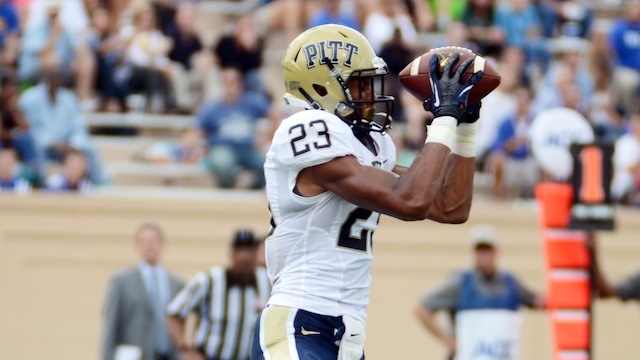 Lafayette Pitts is an ideal corner for Pat Narduzzi’s scheme. Narduzzi loves his corners to be physical and willing to play press man for the majority of the game. His counterpart Avonte Maddox is also an experienced corner. The question about Maddox is that at 5’9″ and 165 pounds he doesn’t have the ideal frame to play press man. 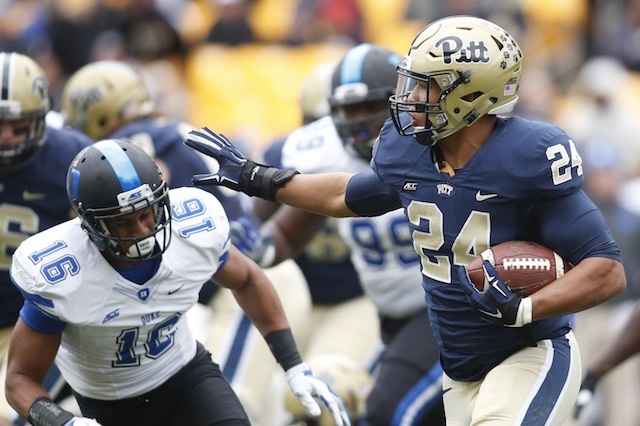 Pitt also returns three safeties who played a fair amount last season in returning starter Reggie Mitchell and last season’s backups Terrish Webb and Pat Amara. Matt Galambos is technically the only returning starter at linebacker, but all three expected starters played in all thirteen games last season, including Galambos. Nicholas Grigsby and Bam Bradley had four tackles for loss apiece as backups last season, with Grigsby recording three sacks and Bradley adding two sacks and an interception to the mix. The effort that it has taken to keep this program at a consistent level amidst constant flux has been truly impressive, and with Narduzzi being potentially the strongest hire they’ve had in this current stretch don’t expect that to change. Conner and Boyd are legitimate playmakers on offense, and the defense should improve under Narduzzi’s direction. The schedule also isn’t too bad in the non-conference even with a trip to Iowa and Notre Dame on the schedule. Iowa is not as daunting a trip as it once was, and Pitt does at least get Notre Dame at home. In conference, Pitt has to travel to Georgia Tech and Virginia Tech, but avoids Florida State and Clemson altogether and gets Louisville at home.